… Many of the above cars had very low miles. Napoleon, Ohio - - Two of ProTeam’s historically significant and highly editorialized Corvettes received the NCRS AMERICAN HERITAGE Award® in Denver at the 2015 NCRS National Convention. The award is among the most respected and important in the marque and it isn’t for the faint of heart. After an initial qualifying round where sign-off is needed to even compete for the prize, the car is then judged on its merit on the national stage. How rare is this feat? Only 44 Corvettes have ever received the AMERICAN HERITAGE® award out of total production of over 1.6 million Corvettes built. 95% (42 of 44) of those awards came between 1974 and 2014. ProTeam’s 1953 Daytona Beach NASCAR #211 and 1958 Chitwood Thrill Show Car are the only two that made the cut at the 2015 NCRS National Convention in Denver. The AMERICAN HERITAGE Award® was created by the National Corvette Restorers Society in order to recognize Corvettes proven historically significant with regard to the marque’s legacy. These cars by their nature fall outside of the NCRS judging criteria, cars like GM styling and GM experimental. As for vintage race cars, they must have actual race history and be presented in the race form. It is an exclusive club. Only two to three vehicles per year are accepted for judging. 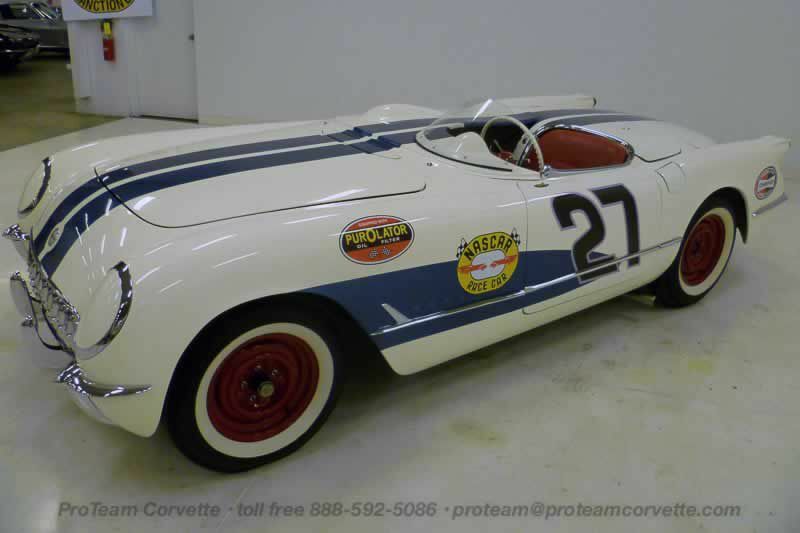 1953 Corvette NASCAR Unit VIN # E53F001211 "THE EARLIEST KNOWN CORVETTE RACE CAR” This Daytona Beach "NASCAR Unit” was created by Chevrolet Engineering for NASCAR stock car racing, and was probably a dual branding effort between Chevrolet’s Ed Cole and NASCAR’s Bill France. This effort was part of Ed Cole’s push to save the Corvette from extinction (700 sales in 1955) and Chevrolet’s first effort in creating a brand image of speed and performance lasting through seven generations of Corvettes. #211 will be on display at National Corvette Museum until September 6th, 2015 in their Special NASCAR Exhibit. 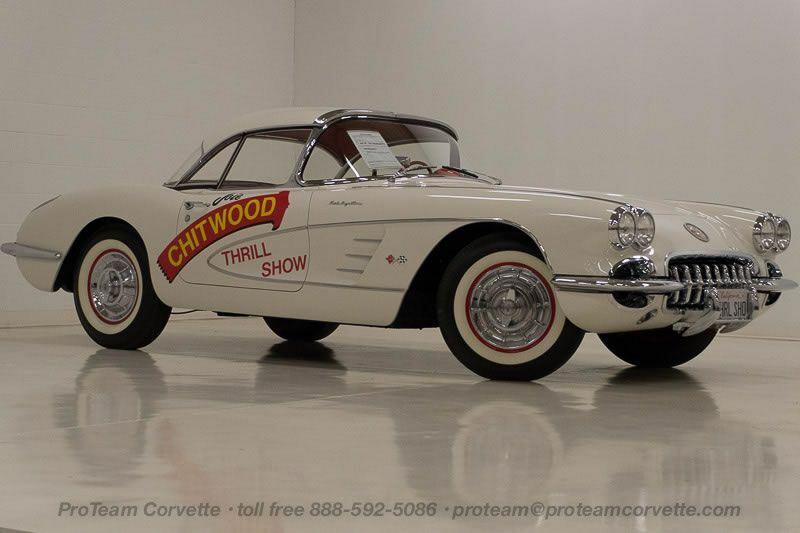 Legendary Joie Chitwood of “Thrill Show” fame ordered the 1958 Chitwood Thrill Show Corvette Convertible Hardtop new. Substantial documentation is included with this vehicle, including original Joie Chitwood promotional materials, video footage of Chitwoods Thrill Show, owner history, the original 1958 registration signed by Joie Chitwood and all registrations thereafter. This is a beautiful, historic, and highly documented vehicle that has been professionally maintained after a nuts-and-bolts restoration. 1958 Corvette Convertible Hardtop, radio delete, 283-290 hp, (fuelie), 4 speed, the "Chitwood Thrill Show Corvette" was ordered new by legendary Joie Chitwood of "Thrill Show" fame and was built in January 1958. 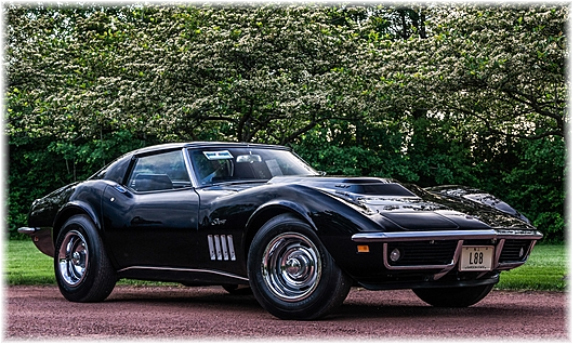 This matching numbers historic Corvette has less than 19,000 original miles. After undergoing a professional nut and bolt restoration the story of the Chitwood Corvette was a featured cover story in Corvette Fever magazine. NCRS American Heritage award sign-off in April 2015. These type restorations normally cost between $80,000.00 to $125,000.00. Joie Chitwood started his racing career in Winfield, Kansas, twice winning the AAA East Coast Sprint car championship and winning the CSRA title in 1942. He competed at the Indianapolis 500 seven times, finishing fifth on three different occasions and he was the first man ever to wear a safety belt at the Indy 500. Most all factory correct type components including the spare, jack, jack tools, trunk mat, trunk liner, rebound straps, seat belts, T-10 transmission, 4:11 posi rear end, shifter, air cleaner, generator, hoses, hose clamps, valve covers, F.I. unit, F.I. fuel filter, guide Y-50 mirror, washboard hood, trunk irons, owners manual, sales brochure, and T-3 headlights. 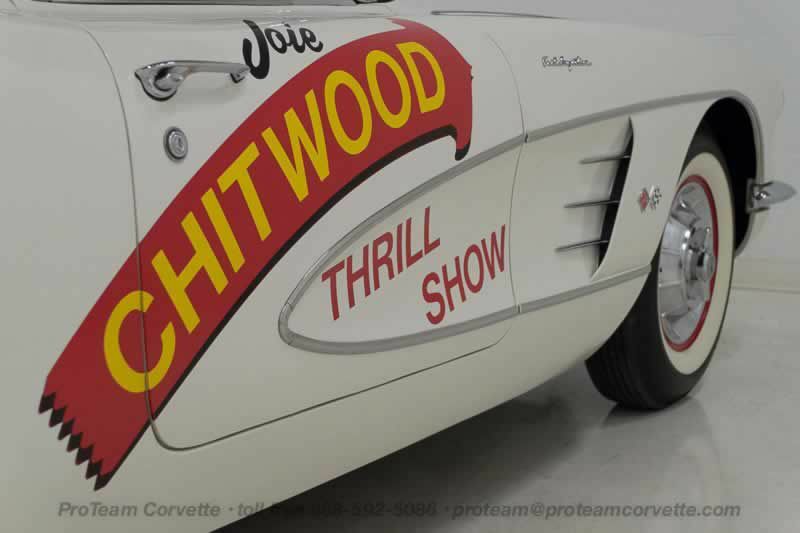 Substantial documentation is included with this vehicle, including original Joie Chitwood promotional materials, video footage of Chitwoods Thrill Show, owner history, the original 1958 registration signed by Joie Chitwood and all registrations thereafter. 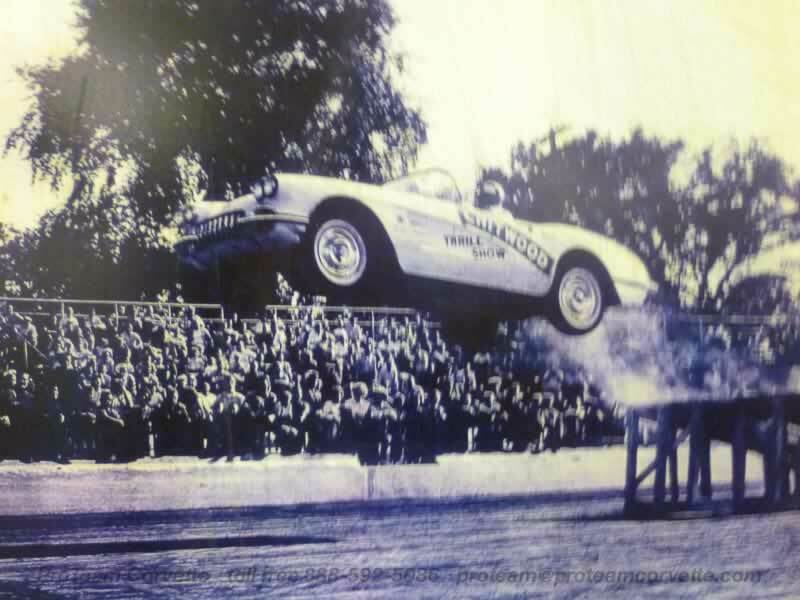 Click here to read more about Joie Chitwood and this Corvette and/or Click here to watch the 10-minute GM promotional film Joie Chitwood's "Thrill Driver's Choice". This is a beautiful, historic, and highly documented vehicle that has been professionally maintained and displayed in climate controlled conditions.